His first rabbit Minx, was purchased from the Humane society. She was very gentle and loving. Kevin had a great deal of fun with her, so he decided to buy another rabbit, Ginger. They had a great time together. Then they were moved outside to the shed, where they escaped. So we headed back to the Humane society and bought Cocoa. She was very lonely so we surprised Kevin for Christmas with another rabbit, Jingles, Unfortunately every rabbit that Kevin received ended in a tragic story until the Easter of 2007 when we purchased Nibbles. 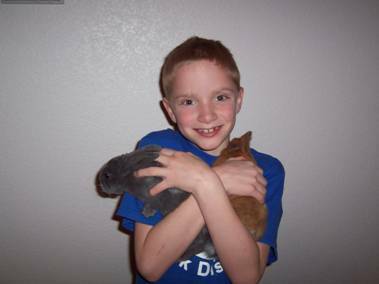 We let Kevin keep that rabbit in his room until later when Steven invested in 5 bunnies. 4 of the 5 became a Beagle feast...this is when Big brother Steven decided to build rabbit hutches in the shed to keep predators from feasting on the vulnerable rabbits. In August 2006 Stephanie became involved in the rabbit scene buy purchasing a red mini rex she named,"Carrot "at the state fair (he fathered numerous offspring) That same year she won a drawing for a rabbit from the State Fair. She also rescued another rabbit named Polly from the Dream Power rescue team. After all the bad fortune Kevin had with rabbits he lost interest and moved on, so Stephanie has inherited the present day rabbit habitat and all the offspring. The rabbit population is always changing here, dying, selling, and more being born. Stephanie has even had the opportunity to hand feed newborns after the momma rabbit was sold accidentally. Stephanie is definitely the animal whisperer on the Scheffler Farm.